According to a Royal Bank of Canada Survey, 82% of high-net-worth individuals in Asia Pacific expect their wealth management relationship to be conducted entirely or mostly through digital channels, while 83% of them said that they are far more likely to leave wealth management firms that cannot offer an integrated digital and direct channel experience. With an online platform for wealth and portfolio management, clients can do a self registration on the portal. They can set-up their account seamlessly and get the latest insights on portfolio management. Experts from wealth management companies can engage with clients on one to one basis based on their portfolio, investments and present them with right opportunities for growth. The companies also charge a nominal fee for offering wealth management as a service. Good marketing is driven by customer needs. The wealth management companies get all information about clients that helps them come up with customized products and services for clients. These companies can make suggestions based on clients’ financial goals, investment horizon and current investments. The companies can sell their products and services through integrated ecommerce portals, which is only accessible to the members. Tax planning, consulting, returns filing, mutual funds, real estate, & other products can listed on the portal. The wealth management companies are leveraging digitisation to offer their products and services. The high net worth clients & young age investors are particularly digitally savvy. 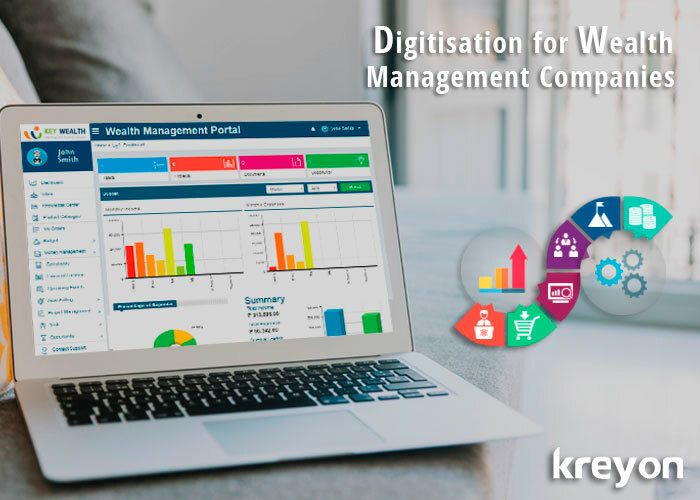 An integrated wealth management portal can help clients to dynamically track their financial health at one place, learn about investments, savings, loans etc. It enables them to make healthy choices for their future. Wealth managers can use digital capabilities to create compelling opportunities, improve their outreach and win greater market share.